Kragthorpe: Could BYU’s Zach Wilson and Utah’s Jack Tuttle start as freshmen QBs? That would be historic. BYU’s job is open; Tuttle would have to unseat Tyler Huntley. (Steve Griffin | The Salt Lake Tribune) BYU quarterback Zach Wilson reaches for the snap during spring football practice for BYU in the indoor practice facility in Provo Thursday, March 15, 2018. This has happened once in the state’s major college football history when Utah State’s Chuckie Keeton became a season-opening starting quarterback as a freshman in 2011. This never has happened in journalism: a story about high school football players enrolling in college in the winter that fails to list the senior prom among everything they’re potentially missing by graduating early. Those are the challenges and opportunities awaiting BYU’s Zach Wilson, Utah’s Jack Tuttle and me. They’re in spring practice, adapting to college and trying to prove themselves as capable QBs as soon as possible. I have 700 words to go. BYU’s Beau Hoge and Utah’s Tyler Huntley look like starters in 2018. Even so, Wilson and Tuttle are making very good impressions on their campuses, and it would not be shocking to see them play early in their careers. That’s the nature of college football these days, judging by this past January’s national championship game. In the second half, Alabama’s Tua Tagovailoa outdueled Georgia’s Jake Fromm — two freshmen who had enrolled early. “Guys nowadays are a little bit more ready to play as young guys than they used to be,” said BYU offensive coordinator Jeff Grimes, who came from LSU of the Southeastern Conference — the league that produced the title game contestants. So it could happen at BYU and Utah, even if it would take quite a convergence for both Wilson and Tuttle to win these jobs in 2018. “Time has proven that freshmen can have a chance to play if they get here early,” BYU quarterbacks coach Aaron Roderick said. Which will come first: the Zach Attack in Provo or the Jack Attack in Salt Lake City? Wilson is the logical answer because Tyler Huntley is established as Utah’s quarterback. Among the variables is Huntley’s health — he missed two games and most of another due to injury last season. 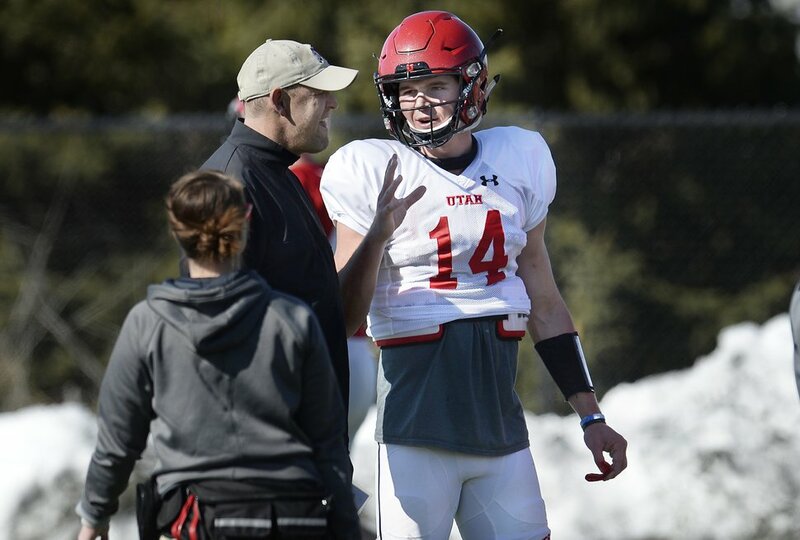 Roderick was Utah’s offensive coordinator in 2016 when Huntley arrived in the spring and competed as a freshman for the job that ultimately went to Troy Williams, a junior college transfer. Troy Taylor, who replaced Roderick, promoted Huntley over Williams last August. Taylor now has an investment in Huntley. Then again, he made an unconventional selection of unproven talent over experience last year, and he could make the same choice with Tuttle. Regardless of when they get started, Wilson and Tuttle have the potential to restore BYU’s quarterbacking tradition and redefine the position at Utah. As an incoming player, Wilson is not available to the media this spring. His Corner Canyon High School team lost in the Class 4A state semifinals in November. Otherwise, the championship game would have featured him and Lehi’s Cammon Cooper, who’s competing for Washington State’s starting job this spring. Jake Heaps came the closest to starting a BYU season opener as a freshman. He alternated with Riley Nelson on each series against Washington in 2010. Colombi redshirted last season, when redshirt freshman Jordan Love took the job in October and went 3-3. The Aggies lost their last two games, despite decent performances by Love. Keeton went only 3-5 as a freshman starter in 2011, although he played brilliantly in the season opener at Auburn. He passed for 213 yards and ran for two touchdowns as the Aggies led the defending national champions 38-28 before Auburn scored two touchdowns in the final 2:07. In another career twist, Keeton became only the second FBS quarterback to start five season openers, thanks to a medical exception. Keeton’s debut came after he joined the Aggies in the summer, unlike the college-bound calendars of Wilson and Tuttle. The Texan took the field at Auburn just a few months after his senior prom. Records for freshmen starting quarterbacks in Utah’s FBS programs in the past decade.